Kevin Paredes/Photo Editor The Food Co-op has been closed since Monday, April 9 to address a number of critical and general deficiencies found by the New York State Department of Agriculture and Markets during inspections. 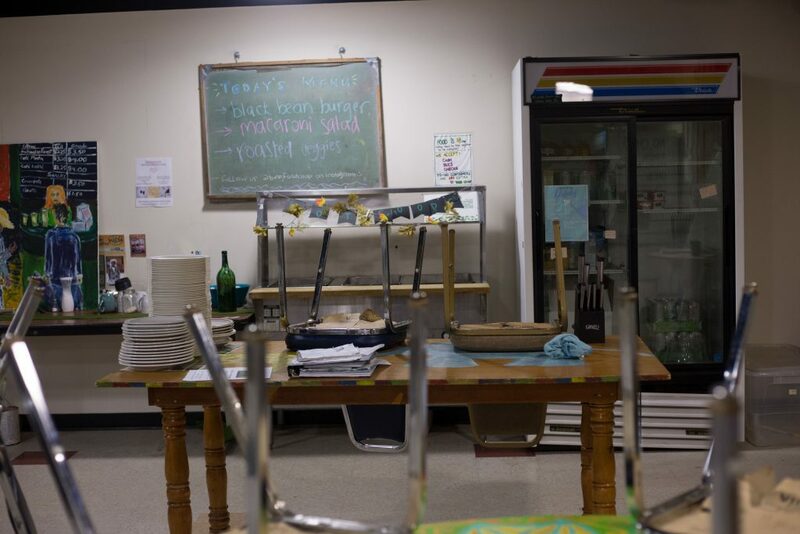 After 43 years of providing students with food options aside from Sodexo vendors, the Student Association (SA) forced the Food Co-op to temporarily close its doors on Monday, April 9 due to poor performance on its 2018 health and sanitation inspections. The Food Co-op, located in the basement of the University Union in Room UU-B30, has long provided students with various organic, vegan, vegetarian, gluten-free and local food products, including microgreens from student-run business Infiniti Greens, and student-cooked food from Monday to Friday at noon. Additionally, the Food Co-op Executive Board often hosts informational events and the group also serves as a social space where students can hang out without purchasing any food. However, in a sanitary inspection report from Jan. 26, the Food Co-op had several general deficiencies and one critical deficiency. According to Lisa Koumjian, a public information officer for the New York State Department of Agriculture and Markets, critical deficiencies are those that could cause health issues. The Co-op failed to follow proper hot-holding procedures for one of its dishes, according to the sanitation inspection report. In the report, the inspector wrote that a cooked vegetable medley entree was kept at 109 degrees Fahrenheit by the self-serve hot holding unit. Sanitary inspection guidelines indicate that food becomes potentially hazardous to serve if it is kept below 135 degrees Fahrenheit. The issue was corrected at the time of inspection, but the Food Co-op was told to expect a follow-up inspection to ensure the problem was solved. During the inspection on Jan. 26, the Co-op was also written up for nine general deficiencies, including mouse droppings on the floor, heavily used fly ribbons in the kitchen, a lack of sanitary test devices in the establishment and dark residue and rust deposits on an equipment storage rack. In the follow-up inspection on March 21, the Food Co-op managed to amend two general deficiencies from the earlier inspection, but received two new violations: one pan of food in the hot holding unit had an internal temperature of 123 degrees Fahrenheit, and the organization failed to post the date and results of its most recent sanitary inspection. Additionally, another tray of food in the hot holding unit had an internal temperature of 100 degrees Fahrenheit, leading to another critical deficiency write-up. Because of its poor results, the organization received a $600 fine from the Department of Agriculture and Markets. Since receiving the fine, the co-op has set procedures to ensure they heat up food to the required temperature and is looking into purchasing new equipment, according to one e-board member who wished to remain anonymous. The e-board member said the business’ doors will remain closed until its coordinators can raise the organization’s sanitation to the Department of Agriculture and Markets’ standards. Matthew Johnson, assistant director of the SA, wrote in an email that while the Food Co-op works to amend its deficiencies, the organization’s space is being cleaned and organized. The SA and the Food Co-op Executive Board have scheduled a meeting on April 17 to discuss the violations and how to amend them.